Apart from representations of the actual betrothal or the journey to Bethlehem or images of the Holy Family, rarely do we see Mary and Joseph portrayed as husband and wife in a loving relationship. Such visualization is helpful and even necessary to aid the imagination of couples wishing to pattern their marriages after that of the Holy Spouses. Fr. Franco Verri, C.S.J. has painted a suitable image, “The Holy Spouses, Mary and Joseph,” in his series for the St. Joseph Shrine at the mother-house of the Oblates of St. Joseph in Asti, Italy. 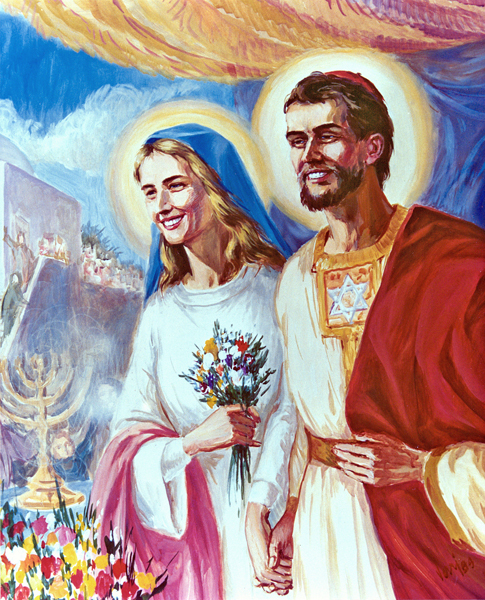 His painting shows Mary and Joseph hand in hand with peaceful smiles indicating the purity and joy in their hearts. The California Oblates have adopted this picture as the official emblem for their Holy Spouses ministry. It serves well for holy cards, with the Holy Spouses Rosary printed on the reverse. Couples are encouraged to hang larger framed versions of it in their homes as a reminder of their commitment to live their married vocation. For those couples wishing to enroll in the Holy Spouses Society described below, there is a special enthronement rite to be done in the home.